I'm happy to announce a new venture created by some awesome friends of mine: Hostfully. 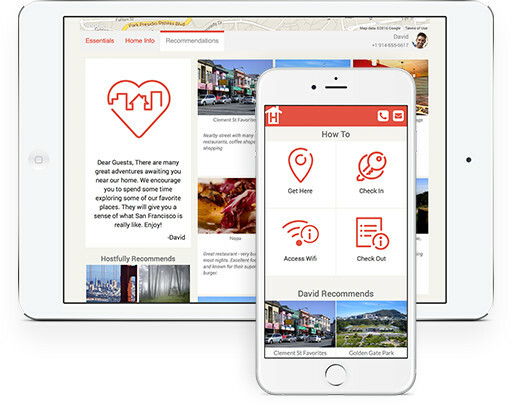 Hostfully makes it easy for anyone to be an awesome host for your houseguests, whether you are using AirBNB, Couchsurfing, or just having some friends over for the weekend. Check out the fun video explaining how it all works. I try and be a great host when I have people crash at my place. I have a long list of recommendations for cool stuff to see, do, and eat in my neighborhood and my city. Having a tool that makes it easier for my guests to take advantage of that is something I would definitely use. I'll give it a try and post more soon. Meanwhile, check it out for yourself at hostfully.com. UPDATE: I made my first guide! It was super easy and fun. Check out some of my local picks in SF.